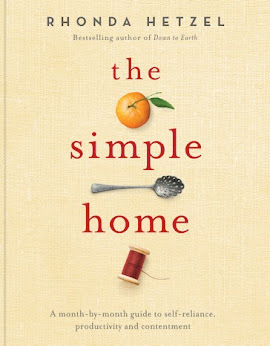 When I started living more simply I didn't know what simple living was. All I knew was that I didn't want to work and for me that presented a dilemma. You see, I am a working class girl. So if I wasn't going to be working, what would I do? It was important that I continue to work in some way so I was really pleased when I realised that I could change the way I lived by working in a different way. Not only would I have a simple philosophy, I would also express myself by simplifying my everyday activities. I didn't know it then but I was about to reinvent myself and my life and I would never look back. This week's flowers are camellias and clivia. It became clear very quickly that changing one thing lead to another and that most household activities were linked. Learning how to stockpile, made me look at the way I cooked, that linked to my budgeting and how I spent my time. 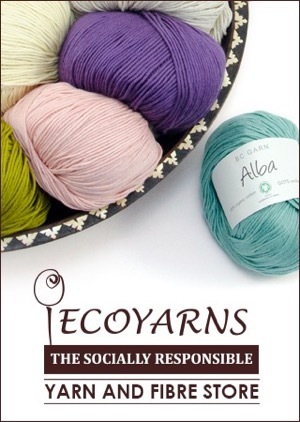 Wanting to reduce the amount of waste we threw out and the amount of packaging we brought into our home lead me to knitting dishcloths, which lead to knitting jumpers, and sewing in all its various ways. So instead of planning what I would do, I just did what I was interested and that lead me on to the next thing and the next. A fruit loaf made last week. We all know this journey never ends and that there is no one size fits all - each and every simple life is different. I am interested in knowing what lead you to your simple changes and how you have simplified. If you have a blog, please leave a link so I can read a bit about you in the coming days. This is a fascinating subject and I am sure that discussing it like this will help others who are thinking about change but haven't taken the plunge yet. The tipping point for me was us living paycheck to paycheck on a more than adequate salary. We have accumulated all this "stuff" and were no happier, but much more indebted to an economy we don't really believe in. I want to leave my children a better world. I want them to understand that money isn't happiness and that being self sufficient is infinitely rewarding. Your blog is such an inspiration. We have a long way to go but I'm so pleased with how far we've come! Thanks Rhonda! Wonderful question, and I look forward to the replies - I think my blog reading list is going to expand! I am striving to live more simply for two reasons: health and finances. The health being the first as I'm not able to work for quite a few years, and thus we live on one income which results in #2 - finances. I am a Texan in my late fifties. The economy is a scary place--and our approaching retirement is even scarier. After several years of surveying my lifestyle, I have come to the conclusion that simplicity is a perfect fit. I guess I'm a late bloomer, but I've decided to commit the balance of my life to make this world a better place--at least, my little corner of it. Your blog has been such an inspiration to me. Maybe I don't have the room to grow a garden, but I do have room to plant my herbs and tomatoes. I hope with time, one skill will lead to another and maybe someday I'll have the sense of accomplishment that you must feel every morning when you get up. Thanks to you and Hanno for sharing your lives with us and letting us peek into your home. This blog spans many countries and amazes me how much we all have in common--making it a less scary place after all. Thanks to you and everyone who has shared piece of themselves through this awesome blog. A good post. I can relate to how you began this journey and things just started magically falling into place. All things are entwined and inter connected. When we are loaded down with physical clutter it makes our mind and body heavy too. I had an enormous amount of debt acquired by filling my home & life with stuff. I really wanted neither in my life anymore so i began first by tackling the debt..and as i watched the balances going down each month i felt a renewed sense of spirit which inspired me take on the removal of the 'physical clutter'. Starting small i shed a few of my belongings. The feeling was so intense and powerful (in a good way) that i made another round. Then another, and another, i was on a natural high. I kept my head down and my actions focused, and when i finally came up for air, i was debt & clutter free. I decided to change how my whole family lived about 3 years ago when it felt like we were doing nothing but paying debt. It has been a very hard time with many struggles, but along the way I have discovered stockpiling, baking bread,yoghurt making, making our food from scratch,growing veg, keeping chickens,making sure I get the best deal on everything we need to buy. Some of these we already did but every thing has stepped up a gear like I have always baked but now I bake everything which is quite a lot for a family of 8. The outcome of all this is we became debt free at Easter this year. And this weekend we have been putting up a poly tunnel which we have saved for and paid cash for. This will be fun to read everyone's answer. I have put my answer up on my blog at http://www.terrycorum.com. My blog is not at all up to date! All I ever truly wanted to be was a stay-at-home Mom. I'm taking a first step by working only part-time next school year. This will mean a reduction in income, but our garden will make up for it. I'm caught in the cycle you have previously described. I spend my time working. On some days I come home at 5:30 p.m., tired from the day. I'm often not motivated to cook, and we end up doing something fast-healthy-expensive way too often, but that's not what I want to work for! How can this be done by one person with three kids? I'd be curious to hear any ideas. I guess I have been living simply for years, without thinking about it. I have sewn, cooked from scratch, knit etc...partly out of love for it, but also partly to insure we could live well on one income. This year we have branched out a bit with a larger garden, and we are starting to buy locally for our meats. I am in my 40's now, but I am a farmer's daughter and grew up living a simple-healthy lifestyle. My mother had a big, beautiful garden & canned all our food. My father worked in a steel mill, but raised all pork and beef. We traded milk for eggs with a neighbor. I was "green" before it was in. We live in such a high stress, fast paced, quickly changing world, the more I can keep our home time "simple", the happier I will stay. Life is too short to fill my time with things, I would rather love on people. Thanks Rhonda for starting us off thinking about this! I've always been pretty frugal, but I really started thinking about simple living in the last few years, when I had to start working part time as my PhD funding ended. I had to spend less, and do more for myself, and I realised I enjoyed the variety. I also realised that I didn't want to work full time in one job when my studying was finished, so I'd better work out long term how to live on not much money. We've done some very creative things, and your blog has been a source of much inspiration (as well as practical advice on soap making and other things). Firstly, thank you for your wonderful blog. It has been a source of inspiration to me over the last year or so (as I know it has been for many others). The catalyst for me was twofold. Firstly, I found myself getting angry at the level of consumerism in today's society and decided to make my own personal protest by buying nothing brand new for a year. I found this 'cold turkey' approach rather liberating and managed to rediscover my creative side in the process. The second tipping point for me came from a desire to reduce the amount of harmful chemicals in our household. For the last year I have been making most of my own cleaning products and toiletries, and it has been wonderful. I have recently started my own blog to share some of my ideas and projects. I still have a long way to go to achieve the level of simplicity I am seeking, but I am committed and it has been an enjoyable journey so far. 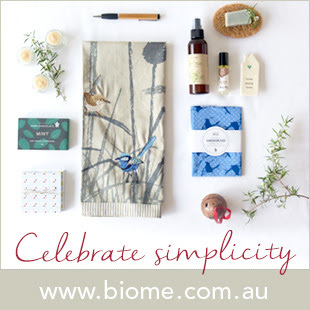 I would love to be able to inspire others to seek simplicity, just like you do! Hi Rhonda - Yours is one of my favorite blogs. And to answer what inspired me to live more simply... well, your blog has helped motivate me to see changes I could make in my lifestyle, and how to put those changes into practice. For example, I just posted on my blog a couple days ago about how I've started making and using knitted dishcloths. I also posted about catching up with a friend from college who grew up in rural West Virginia and kept a spinning wheel (spinning alpaca and dog fur) in our dorm in NYC. Here's the link to one of my posts that goes into detail: Thanks! Thanyou so much for sharing your thoughts each and everyday! I find them very calming, full of wisdom and ideas that I can choose to either implement or store away for future use. I find that rather than changing everything all at once, it is so much easier to change small parts and get that right for our purposes. As a family with young children it isn't always easy, but we have started with a vegetable garden, camping whenever we can, getting out with the boat and fishing, playing a game of soccer at the park, and the list goes on. We have some fantastic memories, beautiful photos and when we sit around the kitchen table to a home prepared dinner we often laugh about incidents/events that occured when having "family" time. Greetings from the Sonoran Desert, USA. I really enjoy your blog and the information you share. My journey began 20 over years ago, was interrupted, and is once again my focus. We are leaving our large house and an un-farmable 1/4 acre of land, and moving into a 2.5 room guest house with a 1/8 of acre of gardens. Once our child left home, we realized we did not need our home or more than half of what we own. Need, is the only word we will listen to right now. Want, seems offensive. On my journey for balance and inner peace...my path is simplicity. Moving, moving, and moving again. With some other moving in between. I grew up with a simple life and after college my wife and I bought lots of stuff, new and used, we bought like our parents were doing, even though we were thirty years younger. A couple corporate moves went well but then we moved on our own and woke up much quicker. Then we lived in India for a year, living on little and seeing people live on even less in the slums. Back in America we now vote with our dollars for fresh local foods and are giving and selling our excess stuff. I thought it would be a challenge to empty our house of 1000 things. That was done in early March. We need to do a second thousand. For now we rent, and went all out on our garden, the only new purchase has been some rabbit fence and some seeds, all the wood, screws, and compost scavenged along with a whole bunch of hours. We may not be as simple as some, but we have many years to go on our journey. I want to learn how to live simply, consciously, before I have children so that this is the world they are brought up in and don't know it any other way. I hate the fact that I have to spend all day in a law firm but we are saving for a house. Working for someone else just gets in the way of all the stuff I want to be doing at home! When I say to others that I love being at home, they think I mean sitting on my bum watching Oprah, but really I am making soap, budgeting, gardening, crocheting dishcloths and thinking up all sorts of things that are productive. This could be a topic for another Biggest Kitchen Table discussion...and whatever happened about the book (I was reading about in the archives)? Is that still on the cards??? I don't know if the lifestyle I lead now is any 'simpler', in fact, in terms of time and energy it may be more complicated. I have to spend half an hour every morning and evening tending my animals, I spend a lot of time in the kitchen cooking and baking, I can't just leave on a whim for a weekend away. But the payoffs are great: fresh vegetables, home grown meat and eggs, baking and bread with no preservatives and more taste and time to spend with my kids and quilt -my consuming hobby. I don't know where the first step happened. Maybe when I was a kid and we lived on 15 acres with a big vege patch and lots of room to run around? I just know that I've wanted to be here for a long time. Now I am and I'm working on making it work. Thanks for all your inspiring writing. The arrival of my first child made me want to live a simpler life... and to be home with her. Once we went on one income and I started "working" to save money, I realized how much waste we produced and all the stuff we traded for time. Our family also work to help improvished villages in Nepal. (We are in the US) Seeing how they live made me even more aware of my consumerist ways. A simple life in the west is actually quite extravagant and luxurious compared to most of the world. I know we are blessed, but don't want to abuse the blessing. That said, it's still hard to live simply when everyone around you is not, but we do our best and do a little at a time. My husband and I are in our mid 30's now, and I think growing-up in the excess of the 80's influenced how we perceived wants and needs. At that time, everyone was working for what they wanted and the concession to us as kids was "things", and "holidays". This is the place we came from when we started to simplify as adults. It has followed us a long way into our journey also. I still receive taps on the shoulder from it, reminding me to let go. It's kind of ironic that we started our acerage lifestyle, with consumeristic eyes. Sure, we wanted to be farmers and all that, but we didn't have the skill-base or sense for that matter, LOL. Living the reality, we realised we haven't stepped-further away from our childhood. Sadly, in many aspects, we're repeating it. Our own daughter has to hear that line of being away to pay for the wants, etc-etc. I guess the only concession we have, is we're not going into it blindsighted. We are attempting to be conscious about our decisions and to add more benefit, than just accumulating another possession. If we cannot justify what we are doing on an ethical level, then it's not worth making sacrifices for. I guess my take on this is, we are pearing down to the bones of our lives. We are not living to be deprived, but neither are we living to unconscious excess either. We have toyed with the idea of selling all our possessions and living in a shoebox; but then we are dealing strictly in possessions and money again. What we need is to learn ethical decision making, no-matter where we live or how the world influences our lives. Simplifying for us has been the process of stopping and paying attention to the details of our existence, rather than numbly running with the mob. After all, if you don't understand what you're doing, how can you place any kind of ethical value to it? Hi Rhonda, I struggled with this once my children were all at school. I knew I didn't want to go back to paid work, yet people's expectations pressured me to think I needed to. I'm glad I am following my instincts where, like you say, one thing leads to another and suddenly our simpler lives are filled with constant learning and busy activities. I find it liberating to live this way, being in control of as many things in my family's lives as possible and filtering out much of the advertising/packaged/consumer ways 'regular' life hounds people with. I am really glad I found your blog earlier this year, as your posts confirm what is often going through my mind. It is such a wonderful place to stop and read a whie and has connected me to other like-minded people, so a BIG thankyou!! Wow. Some fascinating stories. For me, the eureka moment was many years ago. As a young adult I was involved in the anti-nuclear and anti-war movements. There was an actual moment of blinding clarity, marching down the steps of King George Square, arms linked with other protesters, straight into a line of riot-geared police. I thought, wouldn't it be more sensible if we just invented the world we want, and lived it? I don't think I fully appreciated what I had bitten off! Inventing a world is such a huge creative project, and like all creative projects, both hugely challenging and hugely rewarding. But it's the most meaningful work, and becoming more and more so. I started trying to live more simply because my dad was diagnosed, and soon after passed away from stomach cancer. One of the contributing factors was his food, so I started cooking whole food for my 4 kids. After that I started a garden, started waging a war on plastic containers/dishes, etc, and aluminum. Now I'm at the point that I am trying to teach my students more about my ideas (so far they think I'm rather kooky, but I don't mind). My husband also lost his job and we went 8 months before he got another one, and didn't acquire any new debt. My family blog will be linked to this, but my simple steps blog is at simplydawson.blogspot.com . Currently we are trying to pay down all debt, enlarged our garden, and I hope to work on this more once my school is over in two weeks. 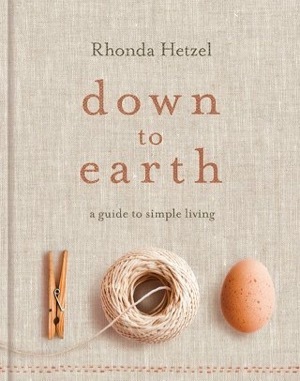 Looking forward to knitting, finishing quilting projects, learning to make noodles, and canning/freezing more food. Small steps lead me to my simple changes. I want to be a positive change in my environment. I want to be more self sufficient. I want to model for my kids what my mom did for me. I had some false starts but I soon realized that the easiest most long lasting changes are ones I make by taking baby steps. I Reduce, Reuse and Recycle. I garden (a new one pops up every year). I bake and cook a lot from scratch. I freeze the summer produce. I am going to try to tackle canning this year. And this fall I plan on beating my fear of baking bread from scratch. Baby Steps works. Ok. Give up that Fruit Loaf recipe. Now. Teehee. This is a hard question, but I think the simplest way to answer it would be to say one thing lead to another. It started with a move to a greener climate (still drought stricken though) where we rented a home with an apricot tree out the back. I'd never been around so much abundance of food and being a frugal person I could not see it go to waste, so I started making jam. Then my husband started a vegetable garden and I had to think of ways to use up all the produce. My husband is a deep thinker and is always coming up with ideas on how to save energy and live smarter, so we feed off each other. With four small children it would be easy to accumulate too much "stuff", and with a small house it is very obvious if we do that. I have made a commitment this winter to make all the clothing items we need for the kids. I thought I wouldn't be brave enough to sew for myself, but again, one thing has lead to another and I have started making my own clothing too, from donated material and refashioning older clothes. I love visitors at my blog and creating a community of online friends that can enhance and add to this wonderful lifestyle we have chosen. Once I became a single mom, we had to keep costs low. I did a lot of shopping at Goodwill before it became fashionable! I still shop there for clothing and stuff for crafting. I use extra large sizes of clothes for the fabric, buttons and zippers. After my daughter grew up, over time I sort of stopped buying things because I didn't need any more anything!! I don't like to go to town anymore, but have to get groceries, so maybe twice a month. If I need something basic, I can go to the small store 2 miles down the road. Thanks for this post that made all of us stop and think. I don't really blog about my frugality, but I so show my chickens and crafts, and common things - like snow on May 22!! The BEST lesson my parents taught me was 'to never buy anything on debt'. I'm in my 50's now, have had little money or more, but never debt. This has been a tremendous thing in my life. Living within your means! Sounds old fashioned but it is empowering. Luckily, I married a man with the same ethos. My parents always had a vegie garden and made a lot themselves. Healthy eating also motivates me. And thats good old homecooking. That way you know what's going in your mouth. Love to read your blog Rhonda! I still learn lots. cYou know this simple lifestyle is something I think I have always craved, just never really been able to do on a full scale. My husband was in the US Air Force for 20 years. He recently retired and now we have finally set down some roots, and began living a simpler life. I hope that this new way of life for us , shows our teenage daughter that there is more to life than material items and I hope it teaches all of us to enjoy the simple things in life more . I have been reading your blog for some time now, and I must Thank you , because I read your ideas ,advice and recipes and I adapt them to fit our lives. I look forward to reading your blog everyday. 30 years ago I divorced a violent hoarder, became a single mum of two with less than half our furnishings. Not being able to afford to replace things we discovered living with less stuff and more happiness was easier. Living beneath my means allowed me to educate my children to their potential. Needs vs wants were easy to see. I learned to say 'I cannot afford that' which is liberating. I like myself, am happy and have peace in my life today. I live a simple life. It is good. Peaceful, calm, happy. I am lucky. Hi Rhonda, I've been reaidng a long time and haven't commented for a while, but thought I would today. My simple steps began with motherhood, and then having to work a job I disliked from home, and wanting desperately to have my only job be that of my own children's mother. So here I am, doing what I can, making every dollar do yoga just to stretch as far as possible! Making do is probably my greatest skill, taught by my Nan to survive on an amazingly short budget with what we could do with around us. Thanks for the opportunity to leave my blog address - it's not fancy, its not up to date, but it sure is testament to me prefering to spend time with my kids than on the computer!!! What a great question! I've enjoyed reading all the comments. For me it is the sense of empowerment I get from learning to do things for myself. I am a single mom to 5, and I am very proud of the fact that I managed to save and purchase my home 100% on my own. I hope that my children grow to see that with determination anything is possible! As you have said, one simple thing leads to another and somehow I just inexplicably find myslf doing and learning more. Here is the link to my blog...although after losing a child, I don't write about my green journey as much as I could. The turning point for me was after the birth of our first born child (son). I got such a peace being at home .. hanging out his clean white diapers and small little outfits on the clothesline in our tiny backyard. We decided to live below our means ... and ... on one income; a philosophy we still use today, twenty-eight years later. Great question, Rhonda! I enjoy reading your blog and learn a lot here. My simple living journey started when I found myself on my own and heading into my 50's. I had no job, no home, no pets. I wanted to take up little space, have no debt and enjoy time for my creative passions-designing jewelry and photography. I found a simple place to call my own, with a very low monthly charge. I work at home, don't shop for much and am growing my first vegetable garden this year. Living simply for our family sort of happened when I fell pregnant with my eldest and so become a stay-home-mum, which was our plan. We moved out of the city, however, now we live by the beach and are so much better off for it. We want for nothing, however, we don't 'keep up with the Jones', we create our own standards that suit our family and are important to us. Sure we don't do the fancy 5 star holidays, but you know what, we don't even like the 5 star holidays. We have a caravan, and have the most wonderful adventures together. My blog is just about me, what I love and what I make/mess up - lol. I love to read other craft blogs and get to know the beautiful people behind them, their inspirations and ideas. Thanks Rhonda for the question, I am looking forward to meeting some other likeminded souls who I just know are out there. I love the idea that it is one thing that leads you down one path that then leads on to another - a journey but at walking pace, not a mad dash that leaves you exhausted but rather a leisurely stroll discovering new pleasures along the way from being at home and having the time to try things like establish a garden or make your own bread. It was tasting a sourdough fruit loaf that led me to baking my own sourdough bread. This was organic, healthy bread but very expensive - I for one cannot afford to pay $7 for one loaf of bread so I had to learn how to make it myself. I found a lady in my community who taught me how to make sourdough bread at home and also gave me my first jar of starter. That was over 4 years ago. Baking bread by hand is now one of my most favourite things to do. I went onto purchase a mill. 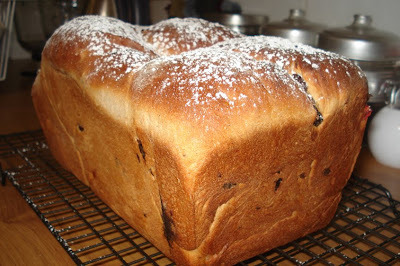 I posted just last week on making fruit and nut sourdough bread. I still make your barmbrack recipe too! I am just starting out on the simple living path. It is one which I look forward to sharing with my children. My hubby and I, like so many others today, have a decent income but seem to struggle. I wouldn't say we are well off, but I believe we have more than enough to live an adequate life and we shouldn't be struggling the way we are. Of course being a "step family" unfortunately it does mean that we lose a sizeable chunk of our income straight to pay maintenance for his children and unfortunately the maintenance that comes in from my ex is just about the very base rate due to his income. I am taking little bits of information from everyone's blogs and slowly piecing together our own version of simple living though. It is a journey for us, but one which will be well worth the effort. We have always been frugal but having my son was a turning point for living more simply and becoming more green and self sufficient. I wanted to be a SAHM, I've fallen in love with gardening and baking bread. I want the world to be a better place for my son. Also DS has multiple food allergies which has made me cook everything from scratch (rather than just a few things), go organic and begin the process of becoming self sufficient. What a great topic. Also an instant lot of other like minded blogs to check out rather than sifting through. Sitting here thinking about how I came to the position we are in. I think a similar childhood basis and just constantly evolving now. As a kid we had chooks, (even in town) mum always made everything, sewed, made bread, things were preserved and money was always consciously spent. Interestingly she has gone the other end of the spectrum now. Never one to love shopping, the consumer world doesn't particularly interest me. I have always loved cooking and taste wise when you make everything from scratch it just tastes so much better. Add in two young kids, one income and a desire to spend more family time together and here I am. I have to say since starting my blog, I have also evolved. Suddenly I am connected with a lot more likeminded people that I wouldn't normally come across in my every day life in a big city- these inspire me, prompt me two strive that bit more, and make that effort. In some ways no life isn't more simple now- I do make it harder by having a lot of time consuming ideals- but is it worth it? You betcha, and I wouldn't change it- it can only grow from here. I decided to challenge myself this year to not spend any unnecessary money on stuff, and blog about it. This was mainly as a challenge to conquer the clutter and debt, but it quickly became also about living simpler and being more self-sufficient and having less impact on the environment. I am becoming quite the non-consumer, and loving it! My paternal grandmother was the queen of frugal. She tended a large garden, canned, kept a milk cow and made her own butter. Chickens supplied fresh eggs. Clothes were hung to dry. Her home was always clean and uncluttered. I didn't know it at the time but lessons learned at her side sunk in deep. While raising my first batch of children we had to be frugal on just a teachers salary. Gardening, sewing, bread baking, etc..
Then after 21 yrs of marriage the unthinkable happened - a divorce. That's when I jumped feet first into the fast lane. I attended college full time, worked full time, and finished raising my then teenagers. There was little time to do anything relaxing, and little time to spend with family. Then after graduating from college and sending my last child off to college I met my wonderful new husband. We made a move, adopted a wonderful little boy, and then my health failed. After almost losing my life to a spinal cord tumor I decided to live deliberately! Allowing myself to enjoy a different pace. I am still recovering so I can not do all that I want, but I keep trying. We homeschool our son and my husband is self-employed so we have lots of time together as a family. We read books aloud as a family, play board games, bake bread, sew, make homemade laundry soap and have chickens in our large back yard. Currently an incubator is on the kitchen counter and hopefully the chicks will hatch tomorrow. I am trying to garden this year but am still having some mobility issues, so my garden is still more of a dream than a reality. Because of a washcloth pattern or link that you posted I am now teaching myself to knit. Basically, we have very little but enjoy life greatly! I so love your blog! Thank you so much for sharing your ideas and wisdom. You and Hanno are welcome in our tiny home anytime! Hi Rhonda. I have made a lot of changes in the past year including teaching myself how to knit and sew (had never in my life learned before) and cooking from scratch as opposed to buying premade things (from sauces to pickles to bread to cheese). I find I actually have a lot more time to enjoy things because I am not worrying about keeping up with fashion, a really long and complicated grocery list and upkeeping a million little possessions and toys. We only by secondhand now and I rarely let plastic in to the home. Overall it's made me a lot more of a conscious consumer and I am enjoying the aesthetic appeal it adds to our home. I have also started our first ever veggie plot in pots and it has been semi-successful. I love the learning process and figure once i actually have some of our own land I'll be a pro.... or something like that. Lots of love. xo m.
I started on our journey as I initially wanted to stop living pay week to pay week. This has gradually led from one thing to another in my simplifying journey. I also became ill last year due to being in a stressful and depressing job, so gave up paid employment to concentrate on getting well and looking after our home and our family. It is taking time to get into a good routine, but it is gradually happening. so strange you should ask this when i've been thinking the very same! we had our new simpler life forced upon us, but we are so glad we did :) we're in our mid forties with 2 children and were so caught up in the consumer world without realising it. we had credit card debts, overdrafts and a mortgage. we dicided to move to sweden from the uk to live in a more rural and wilder environment, so we sold our house, paid our debts off and moved. i had a job as an english teacher and mark ran his business as he had done in the uk, but he produces a luxury item and the market just wasn't there. then i fell very ill with m.e. and our lives changed dramatically. i couldn't work and i had always been the major breadwinner. mark had to get a job, which was not easy as he had been his own boss for many years. then he lost his job. it was during this time that we really started seeing how we could improve our lives, despite not having the money to buy stuff. it's been a tricky time and at first a bit hard on the kids, but we've all realised that it's a much happier way to live. we've really had to stop think and ask ourselves, do we really need that? i love baking, so make all baked goods, we've set up a few raised beds to grow some veg this year, acquired a rhubarb plant traded for some bread, i've learnt to knit, and am repairing clothes. the girls have really gotten into the spirit of it all and are now really good with their money, something i was not until just a couple years ago. Looking back, the drive to live a simpler, more sustainable life stemmed from our desire to find enough money to take our kids on a journey around australia - so in the beginning it was simply about living cheaper. As I began to take baby steps into this simpler life, by making my own cleaning products, meal planning, buying in bulk - I began to see the other benefits - THEN i discovered this blog, which has given me an insight into a world of amazing possabilities and a new way of approaching life. As pointed out by many of those commenting today, it is sometimes a hard journey, but I have realised that making mistakes is all part of this journey and you just have to have the courage to give things a go and let yourself learn these new skills. Thanks Rhonda - you have inspired and continue to inspire me to give things a go and live each day with purpose and intention. There are lots of things I can't do right now that i want to do - it is sometimes very frustrating - but i know that I will get there, I will add these new skills to by tool belt with time, patience and courage! I grew up in as a Mennonite, where life was simple in material things but work was hard. I married a "worldly" man, whom was given everything as a child, and has a high education. The two worlds blended together nicely, but I have to say he did more changing then I did. We farm and he works, part time now, as we wind down to retirement sometime in the next 15 years.We don't have much in the way of extreme value, but our families the farm and each other. As you have pointed out so many times, things happen is small batches and that is how our world has revolved. Each decision is thought out and worked out. Nothing is wasted, things not purchased because we can, many things homemade. I love where I live and how we live. Worries are few. Our income is very limited,because he is on military/Veterans Administration/Social Security disablity. He cannot work. I don't work because even though he can take of himself physically,he can get confused easily, forgets things,etc. Last year we decided to to more for ourselves,so we started a garden.That led to reading blogs and talking with good friends who were on the Journey already,which gave me inspiration. I had already been making soap for gifts,so why not for the family? I started making laundry soap,my own cleaners,composting kitchen waste,and making candles.I also made my first attempt at canning. We have chickens,and are waiting for our turkeys to arrive. It's very rewarding to work on one's land and reap the benefits. Rhonda, I looove your blog.I find great inspiration from it. Thank you! Thanks for todays post, it was good. in fact I enjoy almost everyone. (Some of the gardening stuff I can´t really relate to). Every time I comment I say thanks. That because I am truly grateful for your blog and I benefit from it. Simplicity and self-sufficiency is the way of the past. We have temporarily been off that path for some time(i.e. the western world. Simplicity, knitting, cooking, baking and sowing comes naturally to me. My husband jokes about that all I need to make me content is running water and electricity. I´ts true. I don´t need a lot of stuff. However my life at the moment is not that simple. I´m forced to work. Belive me Rhonda it´s not about any luxury or vacations. It´s about 5 people living in 80m2, paying off mortgagae, raising kids and putting food on the table. Sometimes i´ts like that. But that´s okay. Simplicity lives within you. I do what I can towards that lifestyle when I can. I bake bread, knit and walk to work when I can. Now i´m going to take my knitting out in the sun. Have a nice day down under. The last several years my family (small little ones who are homeschooled) have been traveling with my Husband on most of his business trips. We have lived simply in hotels and camping during those trips. Every time we we came home to a huge FARMHOUSE we felt like the home was just storing our belongings. We downsized twice into a smaller home and although we still travel a good bit we actually enjoy coming home to something so cozy. We have been amazed at how freeing it has been. There is less to clean, less debt, more togetherness and more adventures. At the moment I'm trying to wrap my head around an article in this month's Scientific American about how the concept of time may have no real basis to support it! a postscript to my last post! I think the fact that my late husband grew up in dire straits in Hungary after WWII had a lot to do with the fact that we always saved and budgeted. This was a huge dose of reality for him, growing up, and my own parents lived through the depression and were always aware of not wasting anything. I am a 28-year-old newlywed woman, a professional - and a soon-to-be PhD student - looking for enlightenment. Truly, the steps that I've taken toward simplification have not been catalyzed by a monetary need for it, but by a desperate search for something more, something beautiful, something beyond the hollow shell of Western consumerism. I seek God/Goddess, self-reliance, creativity, and to be more in tune with the spirals and cycles of life again. I haven't made many mistakes yet. Two of my three degrees were funded, and my husband and I have small, reliable, high-quality cars. I hope to avoid, in my quest, the million pitfalls just waiting to entrap the unwary consumer. There is something so much more reverent about living simply. We should revere our lives. Great post, thank you for sharing! It's interesting to hear how each decision you made snowballed into a bigger one until you gradually made a greater lifestyle switch. 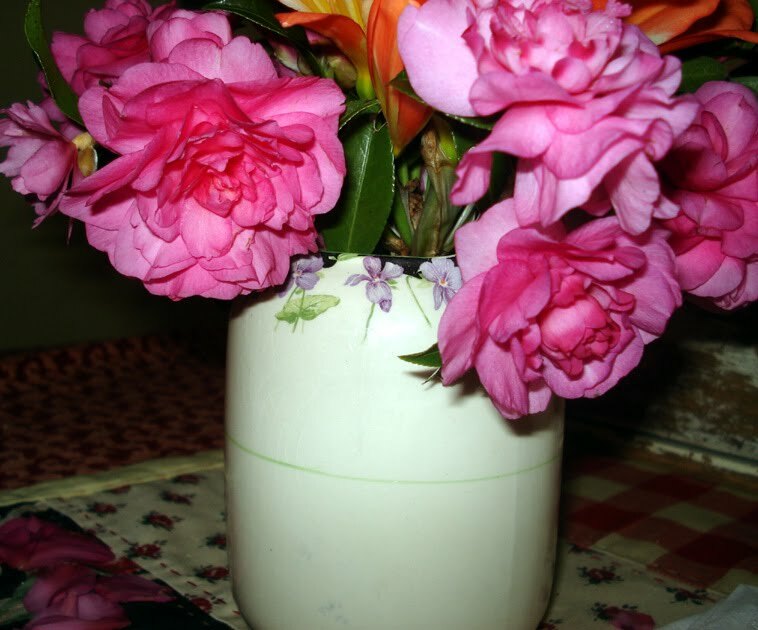 If you're interested in blogs about simple living, check out Maria Rodale's at www.mariasfarmcountrykitchen.com. Join the Facebook group too if you'd like, there's a good community of simple living women there already! A 4 am PBS half-hour special on Tasha Tudor brought me to where I am today. Tasha Tudor wrote and illustrated children's books, but more interestingly, fancied herself the widow of a captain from the 1870s. She dressed period, maintained a period home and garden, and lived very simply. From there, I found the blog www.choosingvoluntarysimplicity.com. It lead me to question my wants and needs. Now, though I'm not quite where I wish to be, I'm living a more fulfilling life than I have in the past. I find this question endlessly fascinating and have enjoyed reading the responses. For myself, I graduated from high school in the early ‘90s in the midst of a serious recession. Demographics were against me, and there were few decent jobs for anyone my age. I ended up working in a bookstore and postponing going on to University because I was the only one working at that shop that didn’t have huge debt in the form of student loans to pay off. I felt I was better off learning to live with very little money than to be in debt. I could afford no extras in my life, no TV, no movies, no meals out. I didn’t even think of owning a car or even buying a bus pass – I cycled and walked everywhere. I didn’t even have a phone! I discovered that small, inexpensive treats like long walks and weekend camping trips, bike rides, a pile of great library books enjoyed on long winter evenings, or a cup of tea and conversation with a friend were far more satisfying than any of the things money could buy. Learning how to have fun without spending money became a passion. Even at that age, I took my father’s advice - It’s not how much you earn that matters, it’s how much you save – seriously, and I refused to go into debt, even for education, especially in an economy where I’d end up back at a minimum wage job until the baby boomers started retiring and positions opened up - something that has happened en masse in Canada in recent years, resulting in a major skilled labour shortage! How different than 20 years ago. With things dire on the job front and further education on hold, I decided to lose the shared, high-rent apartment in the expensive city and get a job at a national park in the Rocky Mountains where at least my room and board would be free. After that taste of wild beauty and wilderness, I couldn’t go back to the getting and spending hustle and bustle of city life and it was my desire to live in a wild place that made the simple living decision for me. My dream was to live in a remote, off-the-grid log cabin in ultimate simplicity, but I married a man who was a bit less rugged than that, so we ended up in a modern home on a forested acreage, not far outside a small mountain town, where we grow our own food and continue to keep it simple, sharing a vehicle, working from home, and trying not to drive into town more than once a week. We build and fix everything ourselves, finding it much more rewarding to learn new skills than to work more at our paying jobs to pay someone else to do it for us. I love the simplicity, the solitude, and the freedom to live each day on my own terms, allowing time to unfold as it will. It is the feeling of not being on the dreadful treadmill of earning and spending and struggling to keep it all together that is most precious of all. Rhonda, your words are always such an inspiration and helpful for us in all stages of our journeys. I don't call mine "simple living" but "conscious and conscience living" since environment/sustainability/fair trade/etc is huge to me (and since I have no interest in homesteading). 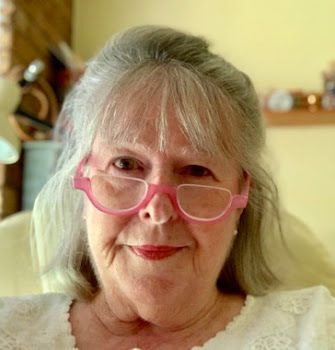 Thank you, Rhonda, for your blog. I love your simple and beautiful life! My husband and I chose living on one income (a journalist's!) to raise our seven children. My husband always says, "I'm rich -- I have everything I always wanted." I've always been keen on reducing my environmental impact due to growing up in a family that was far more aware of these things than many! But I've made more conscious choices over the last couple of years, in part due to having a baby and relearning to survive on a limited income. My husband is an Anglican minister, and our faith has lead us to trying to avoid getting sucked in to the materialism of our culture. In some ways this is really hard at the moment because we're ministering in a very affluent area, and it's easy to forget what's actually normal for Australians, let alone most of the world. But I really don't want to be dependent on stuff, and I don't want my daughter growing up to think that stuff is what makes you happy. So reading blogs like yours helps me keep some perspective!! It's mostly craft & food, but I've (very) recently decided I need to be better at menu planning, so that's a current focus!! Thanks for your gentle, non-judgmental encouragement to live a simpler life. I am a recent subscriber and have been working on living simply since I became a mom 4 years ago. I have cloth diapered 3 kids, knit their diaper covers, and learned to sew diapers. Before I became a mom I never even thought of any of these things. I am 25 years old and people look at me strangely sometimes but it doesn't bother me one bit. :) I have always been the type that loves to learn! I hope to be gardening this year for the first time and have been working on learning to cook. As a teenager I had no will to learn to cook so I am starting from scratch while raising 3 kids, always a challenge haha. My husband is always worried about what the next thing is I get in to or change on him but most of the time if I can show him how it will save us money he will go for it. Oh Rhonda ~ You have done it once again, touched and encouraged many lives, all ages. My husband and I started living frugally as newlyweds on military pay, and have continued to live this way for a little over 40 years now. This morning I made up another batch of dry laundry detergent, now I'm getting ready to go fill more capsules with powdered herbs. Using my bread machine is a regular occurrence. I've got baby tomato plants and basil growing too this year. I already grow tarragon, bay, chives, marjoram, rosemary. It is such a pleasure reading these posts, learning how others got started in this walk of life. We can be so much happier jumping out of the material world, into a land of peace and joy. Yes, we will still have times of discouragement, lots of hard work, but what a life. Thank you again for taking the time to share your life which is a blessing to so many. Below are a couple of posts written on my blog recently about our frugal life. Hi Rhonda, an interesting post. I'll bet it got plenty of people thinking, including me! Looking back, I don't think there was ever an 'eureka' moment. I've always liked baking and needlework and never been that bothered about buying lots of 'things'. As a family we save for what we want and never get into debt. Despite all this I never considered that this way of life had a name! It was just what we did. More recently, with the knowledge of what we are doing to the earth, the natural progression has been to be more aware of the impact we are having and to try to reduce it. I'm grateful for this blog world that allows us to connect with like-minded people and helps us realise there are many, many others who think the same way. I guess it was the desire to learn to do tangible useful things for myself rather than having to rely on being able to buy them. This is probably because my work is an office based job which often feels less than tangible! Although I have no garden, I have a little allotment and have in the last two and a half years eaten my potatos, onions, chard, beetroot, spinach and beans and I feel very lucky and blessed to be able to have a small outdoor space cycling distance from my flat in a city like london! I now bake bread regularaly - ok I do use a bread maker most of the time, but I take sarnies to work most days rather than spending cash in the canteen. I have taken inspiration from your blog and others who have commented here as you are all people who work to live rather than live to work which I often feel I am surrounded by in central london. I have, since last October, managed to change my contract at work and now work 4 days a week which has literally changed my life. Thank you for sharing your life with the world Rhonda - you are touching other peoples' lives. For us the change was and still is a matter of returning to who we truly are. As we worked to find our way in the world we made great progress but now it seems that we were chasing a dream that wasn't ours. Now we're chasing ours. It's not much by most people's standards but to us it means everything. Really enjoying reading everyone's experiences, very interesting. For me, I felt like I was living on a hamster wheel and was exhausted by the pace of my life. Then I lost my job last October and I knew it was the perfect opportunity to really practice simplifying my life. I'm also very concerned with peak oil and climate change so I knew that a simple life would be a sensible thing to implement for me and my husband. We have some debt so that is next on our list to tackle. So the trick will be continuing to balance our simpler life with both of us working full time (once I find a new job that is!). We also want to own a home of our own and will be starting a family. Being fully practiced in living simply now will benefit us dramatically as our lives become busier. Plus we'll have wonderful skills and knowledge to pass on to our children. What impelled me to live simply was my husband's choice of a teaching career and our choice to have six children. It was a challenge to make our one-paycheck income stretch to cover the necessities of life. I sewed pajamas and other clothing for the family, canned, and cooked from scratch. Our only new furniture were beds, kitchen appliances, washer, and dryer. Sometimes a new tv set was purchased new, but it was always a simple one and not too big; it always lasted a LONG time. All our other furniture consisted of family hand me downs and we never minded that it wasn't new. We have always managed to have what we needed, although we never had a lot extra. Now our kids are grown, and we are retired. We continue to live simply and share what we have with others because anything else wouldn't feel right to us. 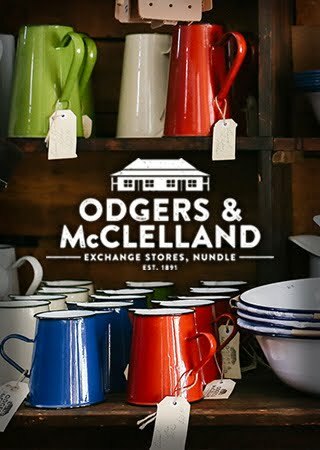 Newbie here from a Frugal Kiwi reader. BTW congratulations on your blogger win! I have been traveling a simpler path the last few years due to some huge life changes. My parents both died of cancer in their mid - sixties, my husband died in a motorcycle accident @ 39 and my son (only child) was killed almost four years ago @ 19. I was a mess, couldn't work and had a massive heart attack that I am not fully recovered from today. My entire life changed in less than seven years. This caused me to look at things much differently. I decided what is really important in my life and what I want to accomplish. Being raised on a farm and living in my beautiful homeplace again I am afforded many luxuries city folk don't have such as space for a huge garden and a barn for livestock. My BF and I started a garden four years ago raising vegetables and herbs. I preserve countless items by canning or drying. (Momma would be so proud!! )Overabundance has lead to some interesting recipes to use all the produce! We also hope to do a farmer's market for produce and canned goods. The more I read, the more I am inspired to try new things on my own. We want to get started on some livestock this summer. And bee keeping. And soap making (helped as a child). And I need to get my sewing machine fixed. And... well you get the point. All that "stuff" just really isn't necessary for us. Our indulgence is our Harleys. Nothing like the wind in your hair!